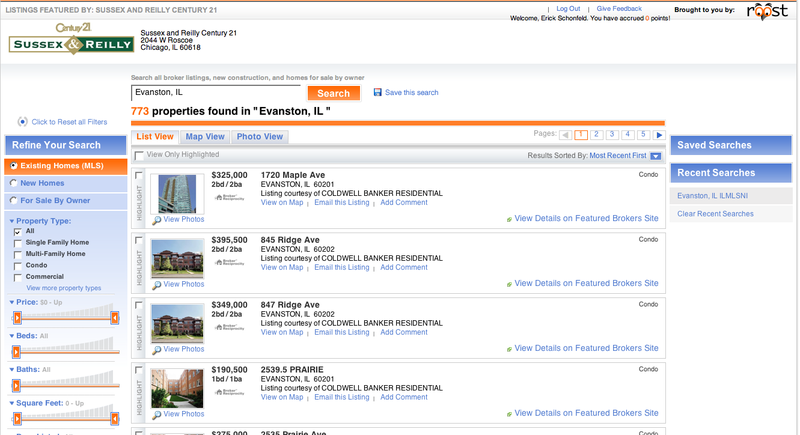 Just when you thought the real-estate bubble had burst and the economy was going to hell, here comes another real-estate search engine. 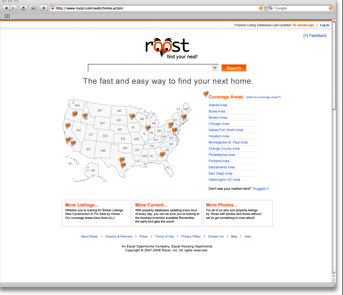 Today we see the launch of Roost, a real-estate site inspired by the lean look and feel of travel search engine Kayak. In fact, two of Roost’s board members and lead investors from General Catalyst Partners are also on the board of Kayak. 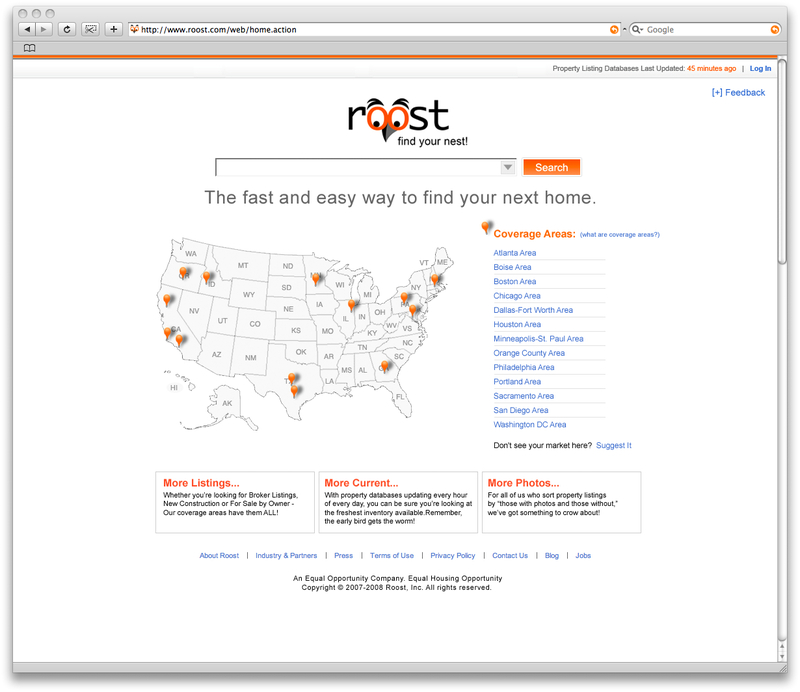 Roost was founded in May 2007, and raised a $5.5 million A round. What makes Roost different is that, instead of trying to list all properties in the U.S. as Zillow or CyberHomes do, or take in feeds from individual real estate brokers as Trulia does, it is negotiating with Multiple Listing Services (MLSs) in each metro area to get a comprehensive set of houses on sale. 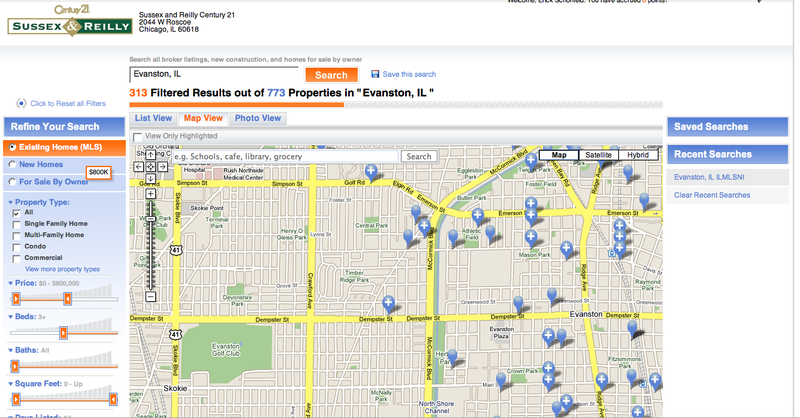 Redfin also taps into the MLS. (The MLS is what real-estate brokers contributeto and use to find homes on the market, and up until recently MLS data was well-guarded from the Web). Roost launches with more than a dozen cities/MLSs, including Atlanta, Boston, Chicago, Dallas, Philadelphia, San Diego, and Washington, D.C. (Notably absent are San Francisco and New York). On the back-end, Roost hosts a directory of real-estate broker sites and delivers search traffic to those sites based on a combination of natural results and paid search. “I send qualified traffic to the broker,” says Chang. “They are buying clicks from me.” That is the business model. But Chang is going to have to crow pretty loud to get noticed by prospective home-buyers who have many other real-estate search engines to choose from these days, and maybe less incentive to go house-hunting in the first place.